Holy cow Julia, this is stunning!! I can't believe you got that amazing aged look using embossing powder, WHAT!!! That is awesome!! Love the pewter frame trim you added and the authentic seashells really take my breath away! Your sand is wonderful, sure looks better than that goopy junk I made to put on my journal page...must grab that recipe! LOVE IT ALL!! Such a pretty card Julia! Love the fancy folding and wonderful collection of seashells! Julia, I simply ADORE this card!!! Thank you so much for providing list of products and step by step for this breathtaking make! Simple rustic elegance of this card stole my heart! When I first saw it my heart skipped a beat...your art is dangerous my dear, hahaha! 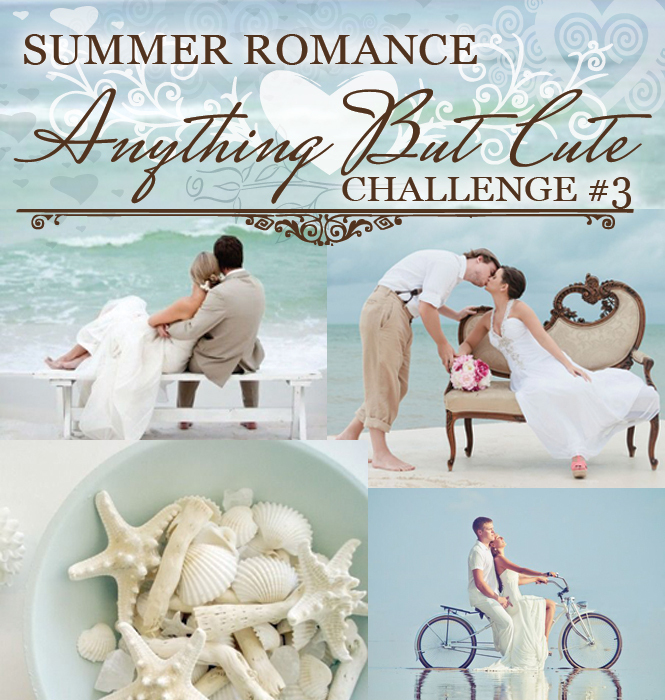 Thank you so very kindly for joining the Summer Romance challenge I am hosting at Anything But Cute!! What a stunning seaside card with so many beautiful details, love it. Stunning what you have achieved with embossing powder! 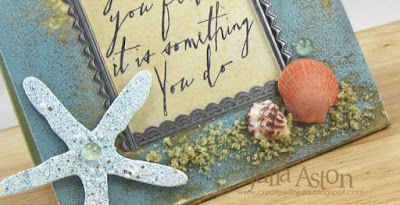 This is a fantabulous design and the added tid bits all make this ocean scene sing. Wonderful seashells and sand. Awesome sauce! Beautiful! 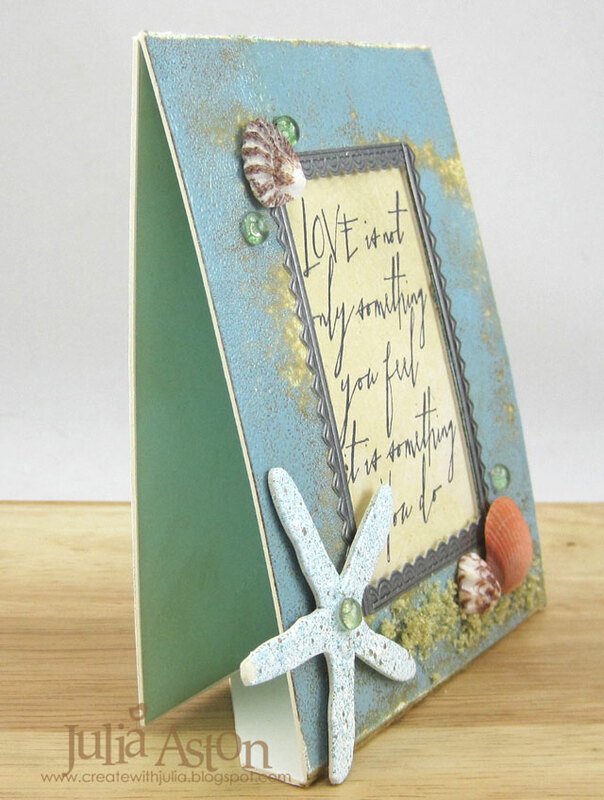 Beautiful beachy card - perfect for summer!! Thank you for playing with us at The Mixed Media Monthly Challenge!! I so love this project! The use of such a great die, along with the gorgeous embossing, combined with a wonderful quote...it's perfection. Thanks so much for joining us at the Frilly and Funkie Challenge! Gorgeous card. 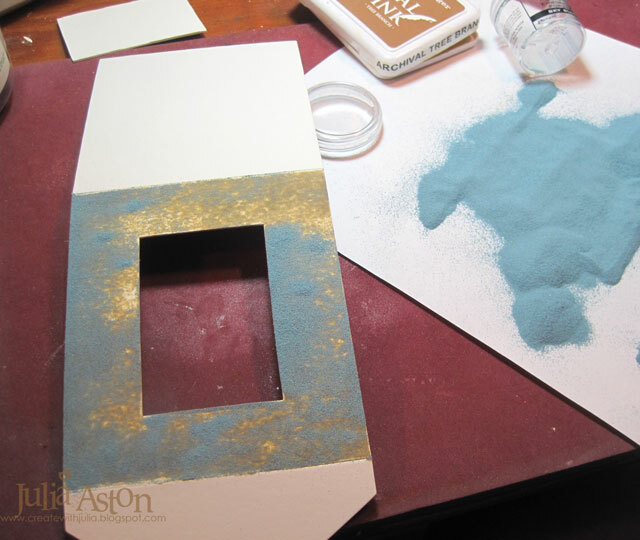 I love the frame and the embossing gives it a weathered look. 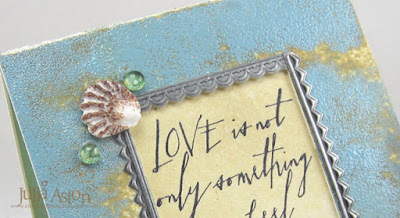 The trim is a lovely offset to the sentiment and the shells and sand are nice finishing touches to your beach inspired card. Thanks for joining us at Anything But Cute. Stunning, Julia! I adore this beautiful beachy design! Beautiful Julia, love the aged effect you achieved with your embossing on the frame and the sentiment is so lovely, thanks for sharing! What a gorgeous frame card. I love how you added the shells and starfish! Thanks so much for playing at The Mixed Media Monthly Challenge. 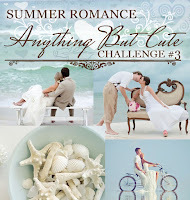 I am a sucker for anything beachy so am absolutely loving what you have created!! love all the little touches made to create such a beautiful piece whether you keep it or chose to share it with a friend... it will truly be treasured I am sure!! 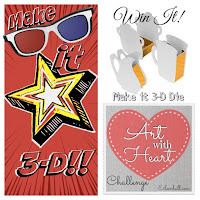 thanks for joining in on our Art with Heart challenge - make it 3D!!!! Oh Julia, such a stunning frame!! Really fabulous and just perfect for our theme at Mixed Media Monthly! Thanks so much for adding it t our challenge! 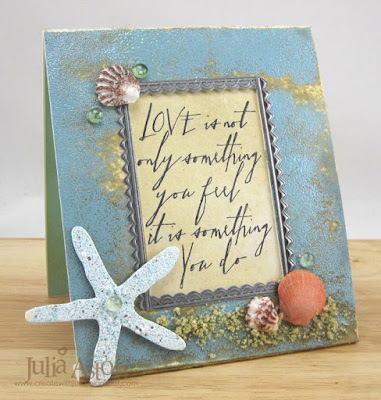 Great way to use the Mailable Frame Julia! 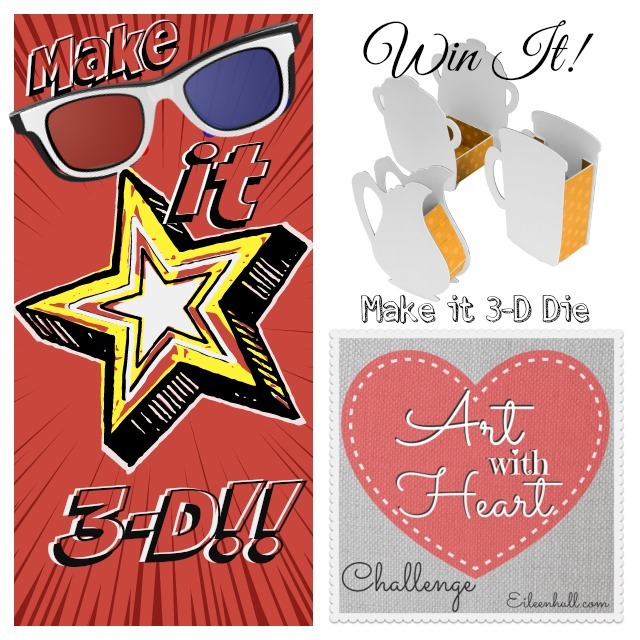 Thanks for entering our Art with heart Challenge! Awesome summer frame card - a perfect summery project!! Love the details you Thanks for joining us in this month's Mixed Media Monthly Challenge! So beautiful!!! Love everything. 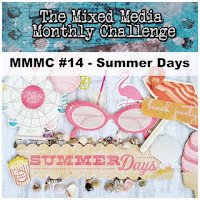 Thanks for playing along at the Mixed Media Monthly Challenge Blog! What a totally gorgeous card that would be a delight for anyone to receive. 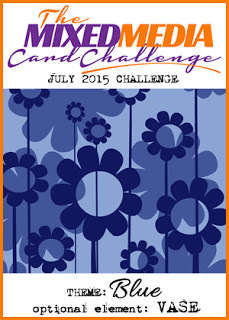 I love the frame and the embellishments you've chosen to compliment our challenge! Wow! This is GORGEOUS, Julia! 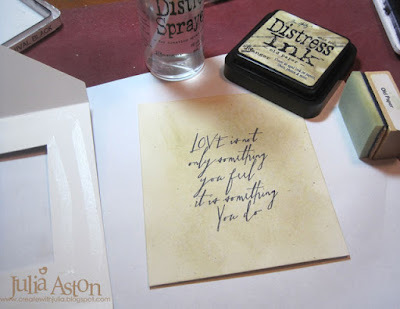 I love how you've used treasures from a trip on this and the sentiment is wonderful! Thanks for sharing the link.